And on the eighth day the Lord did decree that every band from our misspent youth must reform. Preferably for a few statement gigs before the summer festival season ramps up. Were there mixed emotions drifting across the auditorium before the band took the stage? It’s easy to be cynical, perhaps pays to be cynical, the obvious risk that of kitsch, of karaoke. Here the perfunctory performance, there the cabal of washed-up musicians, trotting out the greatest hits package to an uncritical audience because there’s a mortgage to pay and school fees to swindle. Yet that’s not the whole story. For we’re nothing if not pinioned to instinct, the songs to which we pledge allegiance our narrative cohesion, linked to past, suggestive of who we are. Does material that radiated so resplendently all those years ago still work, now that the music gods have lifted the setting, then dumped it into a different time zone? Well, the four middle-aged men on the hallowed dais of the Barrowland Ballroom certainly look like Ride – albeit a version that, just like the rest of us, have grown old and grizzled in the intervening, Andy Bell attired in his usual Oasis conscript’s uniform, Mark Gardener’s fedora nail-gunned to his skull as if it’s 1959, and he’s impersonating a third-rate music hall comic on his uppers. Also: Ride sound like Ride; no scope for imposture. And yes, this is a greatest hits package, because we always knew that it had to be, Gardener summoning one of those coy smiles of his, then we’re straight into ‘Mouse Trap’ – one of several liturgies from Going Blank Again tonight that suggest any existential angst around karaoke or going through the motions is misplaced. What this isn’t, however, is a balls-out, full-frontal assault – at least initially; ‘Chelsea Girl’, ‘Twisterella’, ‘Polar Bear’, and there’s an element of restraint behind each, the band tight but not necessarily overtly expressive. It’s not until ‘Seagull’ (appropriately enough) that the sonic textures truly begin to soar, the channelled dissonance a liberating construct. From a purely observational perspective Ride have always been a fascinating proposition, the contrasting aesthetics (Bell’s melodic inclination; Gardener pursuing hazier routes) that eventually pulled the band apart working both for and against each other. And even here, amidst the reunion bonhomie and songs that are twenty-five years old, such conflicting forces are apparent, Bell’s tracks (‘Cool Your Boots’; ‘Black Nite Crash’; ‘Time of Her Time’) less immediate, the fretwork… well, pedestrian isn’t the right word, but if I use it in the context that Ride were always that little bit special, especially on the early EPs, the first two albums, you might understand why it features here. Were the words “needs more effects pedal” whispered between tracks? It’s possible, but then again, Ride were always peaks and troughs, the lows being relative (if we ignore Tarantula, which is a dog of an album), the highs indicative of what it means to be devout. 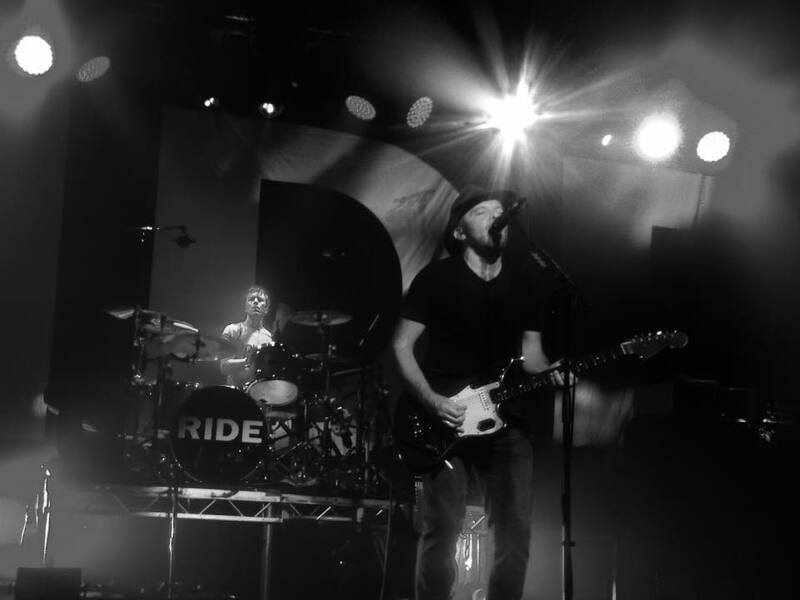 Ride circa 2015, and ‘Dreams Burn Down’, ‘Taste’, then ‘Vapour Trail’ all operate as verisimilitude. Encompassing, fluid, aggressive, layered – all those words that express the validation behind the snarling and robust rhythm section, underpinning twin guitars of a shoegaze bent. Enigmatic; that’s the key concept here. Never mind that the band are having fun, Andy Bell and the Barrowlands ambiance an artist/punter close fit. Never mind that the crowd are well up for it (“Mum – why are all those oldies moshing?”). For it’s when you close your eyes that personal revelation truly comes. Both ‘Drive Blind’ and ‘Leave Them All Behind’ occupy obvious and pre-defined slots in the itinerary (end of main set and encore closer respectively). And both are simply impervious. Resolute. On disc, and ‘Drive Blind’ sits across strata as if some geological exception, and tonight it’s given even more room for its enigma to concatenate, diverting into the five-minute-long holocaust fugue of just the right length and timbre before propelling back into the body of the track. And as for ‘Leave Them All Behind’ – well, yes. That bass line, acting as the anchor through which momentum is extrapolated. “Colours shining clear, fading into night.” And you can almost feel them, feeding across the retro décor of this grand old dame of a venue. It’s track as elongation, evisceration, the guitars oh-so acerbic… you never want it to end. We’ve been well behaved, and have Ride back as a result. The downside is that it’s museum piece Ride, the relevancy tempered by the fact that it’s not 1990, and we no longer have floppy fringes (Mark Gardener especially). Yet just for a fleeting moment, lost amidst the reverb, and it could be 1990 all over again. Just. Nice. I finally get to see them in just over a week in Toronto!